Front 9 are short - the back 9 open up and are longer. Original 9 installed in 1987, South 9 installed in 1989. 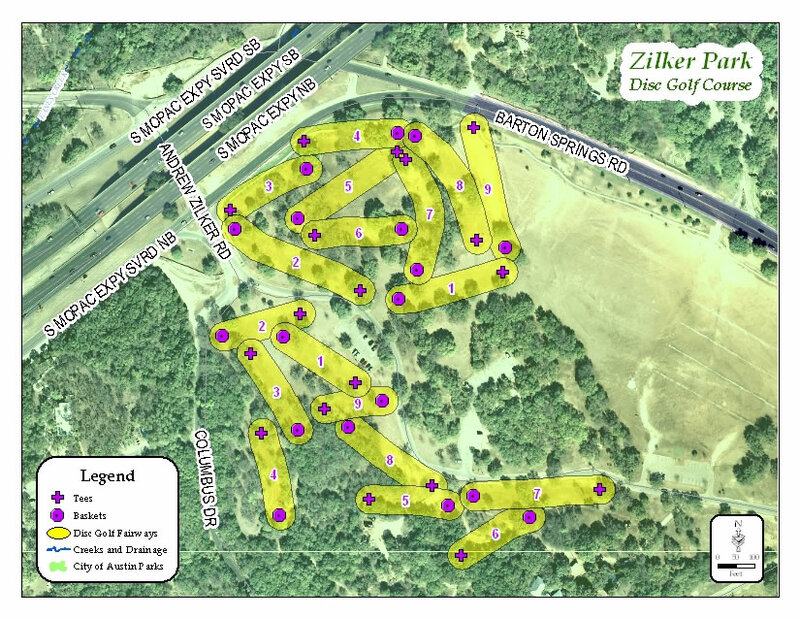 The course reopened in July 2015 after a $200,000 facelift which included signs, markers and enhanced concrete tees thanks to the City of Austin PARD and especially Mike Olse. $5 parking fee weekends - free parking under highway but be very careful crossing busy road. Exit at Riverside off I-35, west 1.1 miles to left on Barton Springs, 1.3 miles to entrance on left. Only played the front 9, but I was a little disappointed. For as big as the park is, and as nice as the holes are, they are right on top of each other. If you do not have a perfect throw, you’re going to be yelling “Fore” a lot. It’s obvious that they put some money into it, but compared to other courses in the area, this just isn’t what I expected. If you’re accurate and looking for a quick par-3 round, this is your course. Great course in great location. Reworked recently with many improvements. Pads, benches, and layout are all first rate. The course is accessible to beginners, with enough challenge for a regular player. Brand new cement tee pads on front nine, as well as huge limestone benches at each tee boxes. Fresh mulch at most holes, some tree maintenance also had been recently accomplished. No signage, so finding some of the course required help from locals. A few longer distance holes on the back nine, but overall a much improved course. Poor signage and overall direction, overcrowded for unknown reasons. Good central location makes it appealing to most; however unless you're on foot, I'd find another course with regular maintenance.